Gear up for loop action! 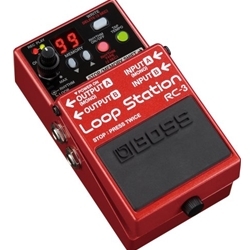 The BOSS RC-3 Loop Station pedal gives you three hours of stereo looping. It's the perfect practice and performance tool for the adventurous guitarist. You can save your loops in 99 memory locations, so you can instantly recall your creations. And you'll appreciate the RC-3 pedal's true stereo I/O, so you can incorporate stereo instruments and devices (there's a 1/8" MP3 player input!). There are even built-in drum patterns to help guide your way to perfect looping. Connect this amazing pedal to your computer via USB 2.0 and save all the looping magic you create on the RC-3 externally.